For those who like their kitchen to look earthy and comfortable, stylish as well as durable must opt for the chestnut glaze design. This particular choice in ready to assemble kitchen cabinets is extremely popular because it is durable as well as universal in looks. It is the perfect blend of the light and dark shades and therefore appeals to all kinds of tastes and decors. It goes extremely well with kitchen walls which have lighter shades like beige and cream. It makes the kitchen look brighter and bigger at the same time creating an illusion of more space. The sturdiness however comes from the wood that makes these ready to assemble kitchen cabinets. You will not be fobbed off with board here as you may have experienced elsewhere. Instead you will find strong and sturdy cabinets made up of pure maple and birch, trees known for producing the strongest of timber over time. Once you get them fitted you can rest easy because your latest kitchen look is sure to last a long time. You get beauty as well as tremendous value for your money. Once fitted, the color comes as a rich shade of chocolate with dark glazes to break the monotony and give more character to the room. The interior as well as the sides are done in the same color so the overall finish is uniform and even. 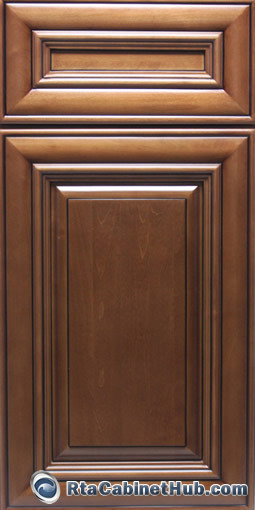 This finish is very important because for the viewer a good finish determines style and class. 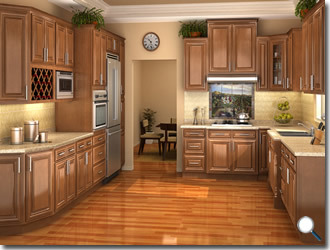 Unfortunately not all ready to assemble kitchen cabinets come with quality finish and look. But with a chestnut glaze design you can buy one with your eyes closed and still get the best of quality to adorn your kitchen. The cabinet doors, drawers and drawer fronts are all made of solid wood with raised panels and full overlay. The face frame consists of 3/4" solid wood while the cabinet box is made of 1/2" plywood. The shelves are made of 5/8" plywood making them strong enough for rough and everyday use. The drawer glides are under mount and come with full extension and built carefully for soft closing, the kind one would only get from customized finish earlier. The hinges are concealed all the way and have 6 way adjustable mechanisms for easy usage. 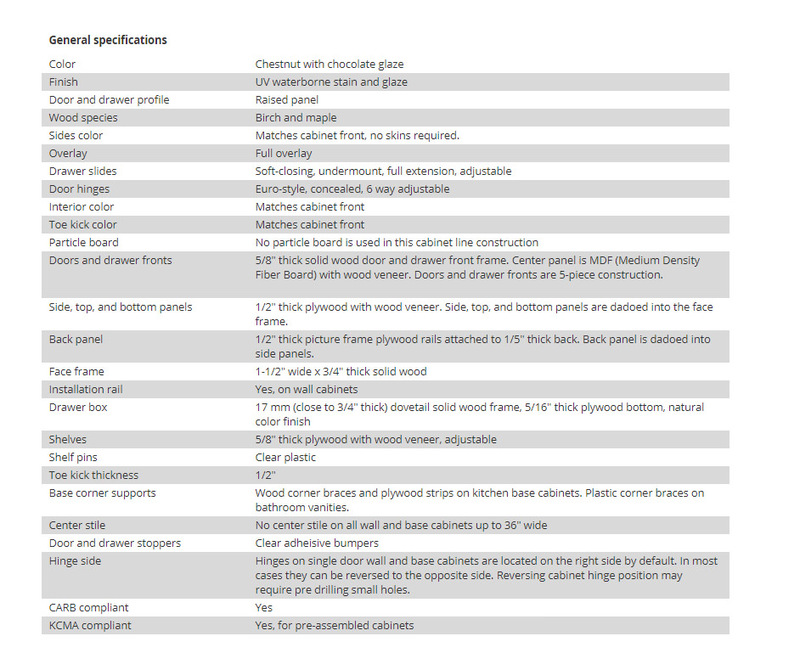 The cabinet comes with a thorough manual for interlocking metal bracket assembly Instructions. All you need is a screwdriver and you are all set to fix your ready to assemble kitchen cabinets. 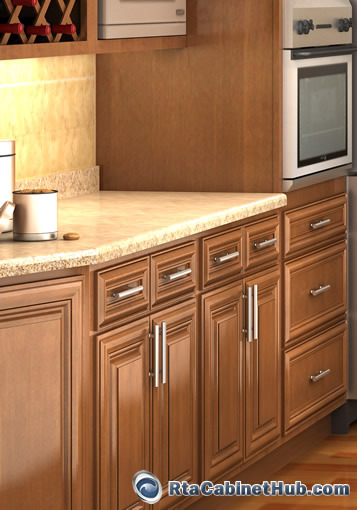 While there are many brands which sell ready to assemble kitchen cabinets online, it is difficult to find one which promises quality, durability and looks all the same time. But when you opt for the chestnut glaze design you will find all these and more. You get the best price guarantee which effectively means that you will not get this quality for this price anywhere else. And if that wasn’t enough to make good ROI then you also have the offer for bulk purchase discounts, free shipping for purchase over $2000 as well as limited time discounts offers during special occasions and seasons. Chestnut Glaze product is identical or similar to Madison Pillow and Majestic Bronze cabinet lines offered by other stores.